In the northern hardwood forest, climate change is poised to reduce the viability of the maple syrup industry, spread wildlife diseases and tree pests, and change timber resources. And, according to a new BioScience paper just released by twenty-one scientists, without long-term studies at the local scale—we will be ill-prepared to predict and manage these effects. Following an exhaustive review of more than fifty years of long term data on environmental conditions at the Hubbard Brook Experimental Forest, located in the White Mountains of New Hampshire, the paper's authors arrived at a sobering conclusion: current climate change models don't account for real life surprises that take place in forests. Lead author Dr. Peter Groffman, a microbial ecologist at the Cary Institute of Ecosystem Studies, comments, "Climate change plays out on a stage that is influenced by land-use patterns and ecosystem dynamics. We found that global climate models omit factors critical to understanding forest response, such as hydrology, soil conditions, and plant-animal interactions." One thing is clear: at Hubbard Brook Forest spring is advancing and fall is retreating. Over the past half century, the climate has warmed and there has been a rise in rainfall and a decrease in snowfall. Winters are getting shorter and milder, with snowpack melting some two weeks earlier. But soil thaw is no longer tightly coupled with spring plant growth, creating a transitional period that results in the loss of important soil nutrients. In the absence of insulating snow pack, exposed soils are more susceptible to freezing, which damages tree roots. 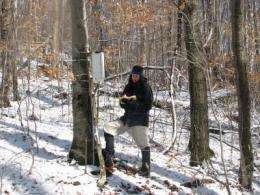 Sugar maples are suffering a one-two punch: soil frost is linked to tree mortality and warmer winters reduce sap yield. Mild winters are also encouraging the spread of pests and pathogens, including the destructive hemlock wooly adelgid—which was once held in check by cold winter temperatures. As snow depth decreases, deer are better able to forage in the forest. Their browsing damages young trees and spreads a parasite that is lethal to moose. Reduced snow pack is also a challenge for logging operations, which use snow-packed roads to move trees, and ski resorts, which already rely heavily on manmade snow. Groffman concludes, "Managing the forests of the future will require moving beyond climate models based on temperature and precipitation, and embracing coordinated long-term studies that account for real-world complexities." Adding, "These studies can be scaled up, to give a more accurate big picture of climate change challenges—while also providing more realistic approaches for tackling problems at the regional scale." This is definitely interesting reading, and it makes sense in light of similar climate trends. I wonder if the colder, more northern climate zones are starting to resemble New England's climate of a few decades ago. "In the northern hardwood forest, climate change is poised to reduce the viability of the maple syrup industry, spread wildlife diseases and tree pests, and change timber resources. And, according to a new BioScience paper just released by twenty-one scientists, without long-term studies at the local scale—we will be ill-prepared to predict and manage these effects." Translated: We are ill-prepared to predict the effects of climate change. Regardless, we predict we will see an increase in wildlife disease, tree pests, and changing timber resources due to climate change. More unadulterated climate change buls**t.
"We found that global climate models omit factors critical to understanding forest response, such as hydrology, soil conditions, and plant-animal interactions." That is true. Most climate models do not factor in forest responses. In the Big picture computer modeling, they show up in the averages, but in smaller localized climate change the only way you find that out is by paying scientist to study the localized changes. I'll do you one more, I think your OPINION is HORSE S**t!